These shows are a reflection of what is going on in our society. These Ramazan shows are a slice of Pakistan today. A bit of religion followed by a bit of gossip and a bit of extravagance and a bit of unethical humiliation of someone who cannot stop us from doing so and a bit of retail therapy – all in a single breath. For those of us who grew up watching PTV, religious shows were an integral and beneficial part of the daily routine. Anything that came on PTV, we watched. As a member of the PTV generation, I grew up watching the daily afternoon show where the recitation of the Holy Quran was taught, and I don’t recall missing Majlis-e-Shaam-e-Gharibaan on any tenth ofMuharram, even as a Sunni. Religion, as presented on TV back then, was something to be respected and honoured on the media. I recall care being taken even about the kind of advertisements that were run between religious shows, if they were any at all. But then the Aalim Online era begun. Make no mistake; as an objective bystander I appreciate the fact that Aalim Online was the first show that brought Islamic scholars of different schools of thought on the same podium, and acted as an interfaith forum of sorts. Many similar shows followed, providing useful information. But then something dangerous happened. These shows started bringing in ratings. And advertisements. And money. Ramazan, followed by Eid is of course heyday for marketeers and consumerists. Therefore, religious shows were morphed into Ramazan religious shows – all in one type – with the azaan, religious scholars and verses of the Holy Quran in one hour and full throttle live entertainment show the next. Every one followed this trend. Money kept rolling in. Ramazan’s spirit of giving was abused into marketing gimmickry. Thousands of motorbikes are given away to people who are willing to sacrifice their self-respect and let their humiliation be broadcasted for it. Karachi’s legendary killer motorbiker boys keep increasing on the streets of a city where 23 million or more reside, but there is no dependable public transport system. But the reality is that in a society with such drastic socio-economic disparity, we often cannot relate to what winning a motorbike or a mobile-phone means to the masses. They struggle every day and pretend to be carrying on a comfortable life, but in reality are exhausted by financial crunches. Here we are, witnessing the beautiful spirit of this month being hijacked by money making machines. These shows, for instance, Pak Ramzan Amir Liaquat Show and Jeeto Pakistanwith Fahad Mustafa, in the long run, will have disastrous and sustained effects on our social fabric. Some are beginning to show already. Thanks to the fact that gifts are given even if the person does not know the answer to “which are Pakistan’s neighbouring countries?” the bar for intelligent general knowledge quizzes is not just being lowered but has been smashed. Levels are also being lowered with regards to collective entertainment. Publicly ridiculing others is considered funny, or people pretend that it is funny because the host is often being praised collectively, so that s/he is happy with the audience and gives away a gift. There is certain decorum – call it adab, if you may – that is required for religious and spiritual messages to permeate a heart. When that is absent, the soul does not absorb the beautiful messages Ramazan is transmitting to it. When a large part of our post-iftar eve is spent watching these shows even though we criticise them, something inside us dies. What’s worse is that the few genuinely informative and interesting religious shows that are on television in Ramazan, such as Baran e Rehmat with Hamza Ali Abbasi, also lose their credibility due to the blanket assumption of viewers that all Ramazan special shows are just the same sub-standard offering. The genuine scholars are respected less due to those who have not yet embodied the beautiful spirit of Ramazan, and in fact of Islam. Thus, some genuinely good shows no longer get the recognition they deserve. 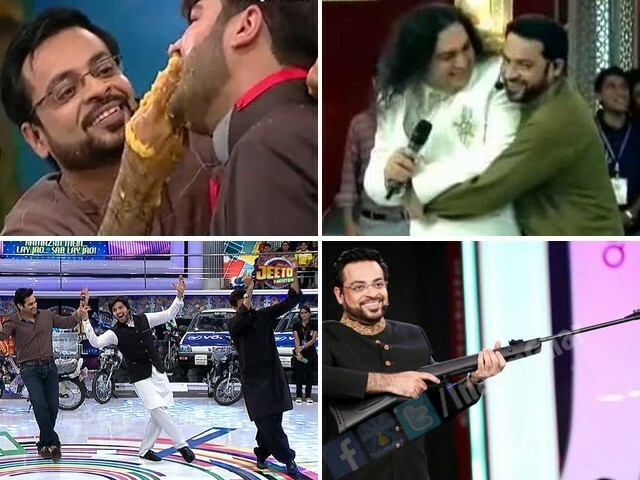 Do the hosts and producers of these shows realise what a powerful medium they have in their hands, and how productively this could be used to propagate the real ideals of Ramazan like charity, hospitality, simplicity, love and compassion? Maybe it’s time to make it a regular dua in Ramazan that may Allah (SWT) guide those who have been given this power to use it responsibly. Posted in Faith, In The Loop and tagged Amir Liaquat Hussain, Fahad Mustafa, GEO, hamza abbasi, Islam, Ramadan. Bookmark the permalink.